A classic izakaya favorite: ebi chili mayo! 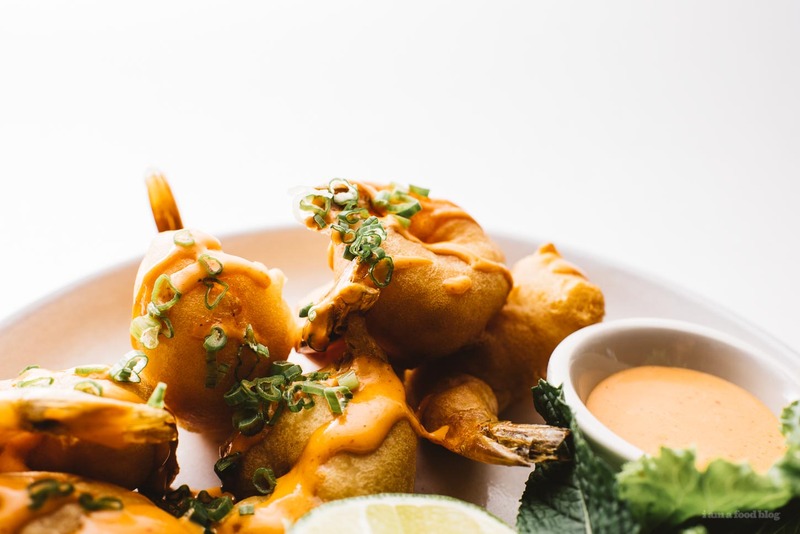 Crispy prawn tempura with a spicy mayo for dipping. Back when Mike and I first started going out, one of our favorite things to do was eat, of course. I was obsessed with izakaya and Japanese drinking food. One of our must-order dishes was ebi chili mayo, essentially crispy prawn tempura served with a spicy mayo. The crispiness of the prawns goes perfectly with the creamy spicy mayo. This recipe seems like it’d be finicky, but it really isn’t. If you’ve deep-fried before you’re basically good to go. It’s an impressive starter or side to make at home, no dressing up and going out needed. Any restaurant-style food I can make at home in sweatpants, hair tied, chillin’ with no make-up on is a good thing. Make sure you have a deep-heavy bottomed pot. It’ll keep your oil hotter and the deep sides will keep your stovetop clean and there won’t be as many splatters. Use a neutral high-heat oil to deep fry. I like using grapeseed, sunflower, safflower, or canola. Don’t make the deep-fry batter until your oil is hot. Don’t stir the batter too much, lumpy batter means crispy batter after it’s deep-fried. 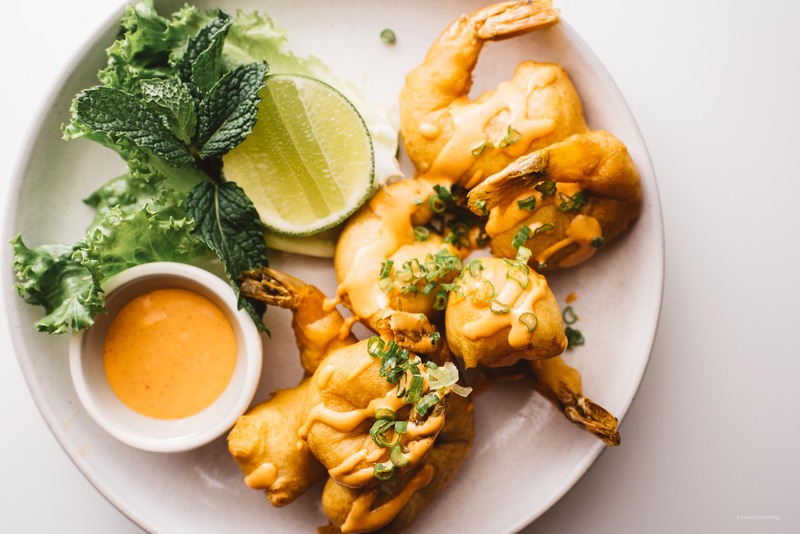 Most restaurants like to serve the prawns completely tossed in the mayo, but I prefer just a drizzle with the most of it on the side for dipping. Date-night in anyone?! Mix together the sriracha and mayo, adjusting to taste, and set aside. Lightly pat the prawns dry with a paper towel. Heat up 2-3 inches of oil in a very deep, heavy bottomed pot, over medium high heat, until it reaches 350°F. When the oil is hot, it’s time to make your batter. In a small bowl, mix together the flours, baking powder, and salt. In another bowl, lightly beat the egg and then pour in the water and 1 tablespoon of oil, mixing slightly. Add the flour mix, all at once. Mix a few times with chopsticks, until loosely combined – lumps are okay. 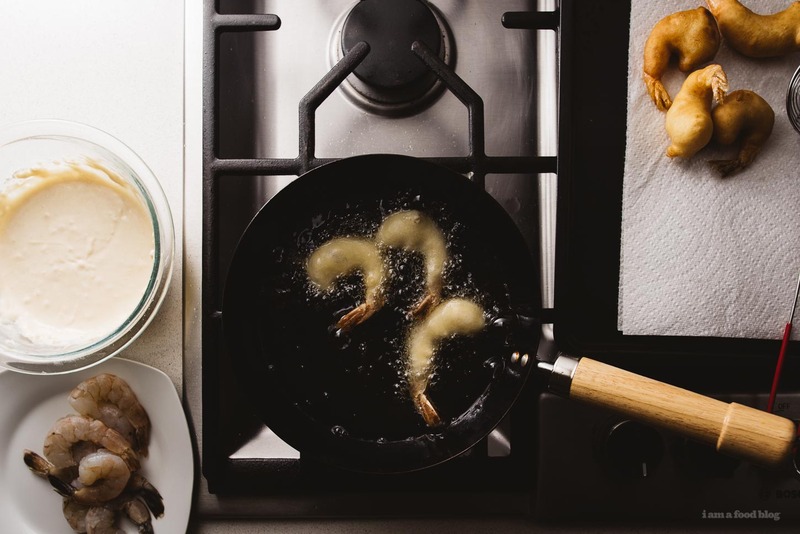 Set up an assembly line beside your stove: the prawns and your bowl of batter. Have a rack set on a plate on the other side of the pot of oil for your finished prawns. Test the oil heat by dropping in a bit of batter. It should drop below the surface then float up almost immediately, surrounded by tiny bubbles boiling around the edges. 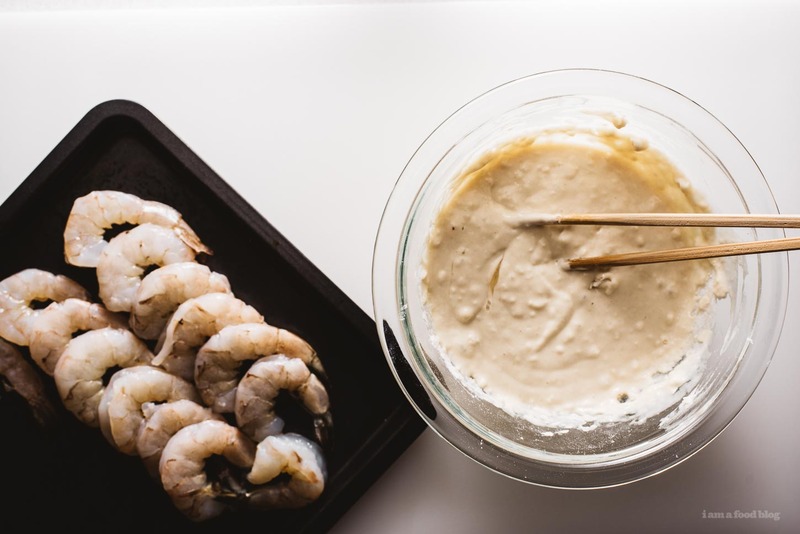 When the oil is ready, use your hands to dip a prawn, holding it by the tail, into the batter. Gently place into the hot oil and fry, turning occasionally until the batter is golden and crisp, 3-5 minutes. Remove from the oil and drain on your prepared rack. 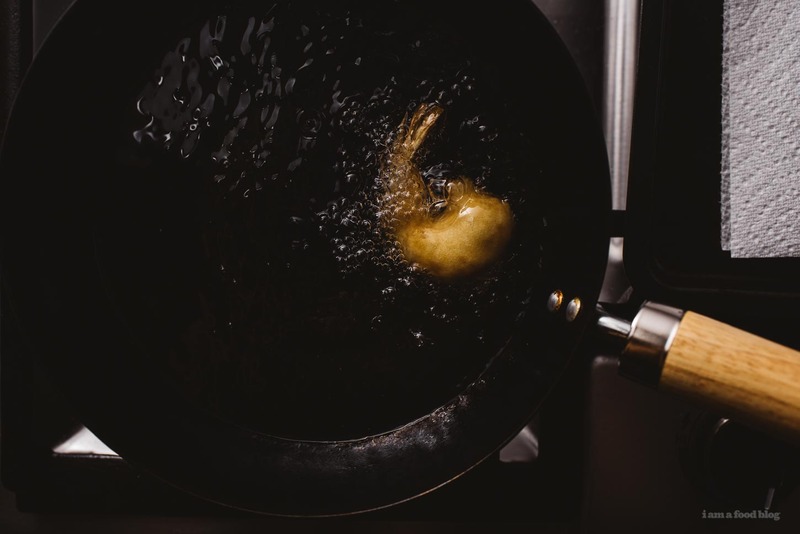 You can cook several prawns at once, just be careful not to crowd the oil and drop the temperature. I wouldn’t cook more than 3 at a time. 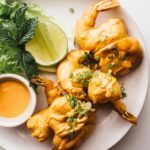 Enjoy with the chili mayo sauce, lettuce, mint, green onions, and lime.